Instead, the Galaxy Nexus uses the Media Transfer Protocol (MTP in short) to allow you to transfer both media but also any type of file to and from your smartphone. MTP is already built-in on most Windows PCs, you only have to connect the Galaxy Nexus with a USB cable and browse the Galaxy Nexus media device as you would have with any drive. 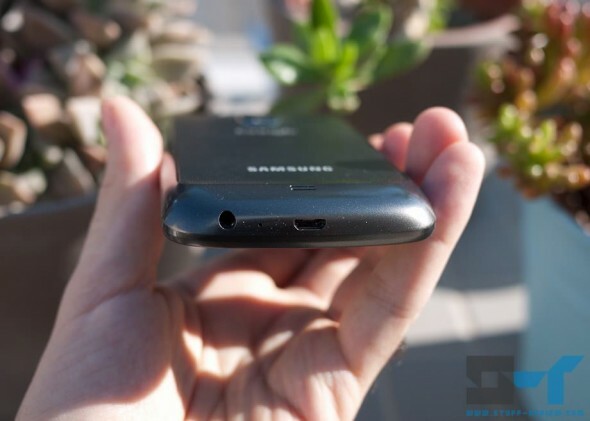 Below you can see how a Windows 7 PC views the Galaxy Nexus. Opening the device shows a standard folder view. Only users with Windows 2000, Windows 98 and Windows Me would need to download additional software. A drawback with MTP is that you can’t alter files directly on the device, you need to download the file to your computer, change it, and then move it back. Though obviously this isn’t a big deal. Mac OS doesn’t have built-in support for MTP, you would need to download and install a special tool, you can find instructions here. 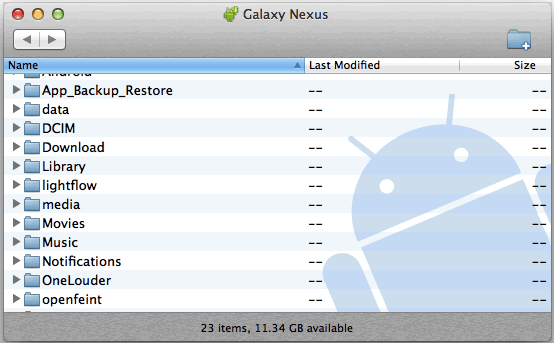 After you install and run the Android File Transfer tool, it will open automatically when you attach the Galaxy Nexus to your Mac. It is however an inconvenience if you want to quickly connect the Nexus to a friend’s Mac computer for example. Below you can see the Android File Transfer tool running on a Mac. The tool is very stripped down, the list view above is the only choice, i.e. forget about thumbnail or Coverflow view modes. On a Mac you can’t preview or open files directly from the Galaxy Nexus, you would first need to transfer the file to your computer. Finally, there are cases where you might want to connect the Galaxy Nexus to another device, e.g. a media player or TV in order to play files. If your hardware doesn’t support MTP you’ll be more or less stuck unfortunately, so you might want to check your device’s capabilities. You will still be able to connect the Nexus to a printer directly in order to print photos since it also supports the Picture Transfer Protocol (PTP). Hope this has cleared any confusion on MTP and the Galaxy Nexus, but please fire away any questions you may still have.